A 43 year old male came to see me for “irritability”. His wife had scheduled the appointment and he provided me with a short narrative of his symptoms. For the past 6 months he has been yelling at the kids and his wife with increased frequency. He was complaining of dissatisfaction with his job and felt like he “had to stick it out” because the pay and benefits were good. He verbalized that he felt “stuck” in his current work situation. The patient admitted he was not a great communicator and kept things to himself rather than discussing his feelings with his wife. This is a common presentation for mood disorders, especially in men. Symptoms may be present for months or even years while they suffer with the internal angst preventing them from living a higher quality of life. As I explained to the patient, my goal is different compared to allopathic doctors in psychiatry or primary care. Most doctors would likely recommend an antidepressant and/or an anti-anxiety medication in order to “minimize” the symptoms. Who really wants symptoms minimized if they can be reversed, especially when medications often come with unwanted side effects (sexual dysfunction is the top of the list for meds that treat mood disorders). Alarmingly, the latest statistic indicates that 1 in 4 adults in the US is taking a medication for a mood disorder. To me, that is unacceptable. If we can identify root cause of any medical problem, including mood disorders, then we have a fighting chance to avoid medication and their side effects. Let’s explore. The latest research indicates that the gut is our “second brain”. In fact, there are more serotonin receptors in your gut than in your brain. Serotonin is a brain chemical that can have its levels artificially increased by medications used to treat mood disorders. But there are other ways besides medication to increase serotonin levels. One other interesting factoid is that there are 500 times more messenger molecules going from the gut to the brain than the reverse. Perhaps, gut instinct (pun intended) would lead us to looking in other areas besides the brain when dealing with a mood disorder. The science is fascinating and as your medical provider, it is critical that I think outside the box and in ways that often run counter to my allopathic providers. Anytime we are dealing with a chronic problem, including mood disorders, we need to think in terms of increased inflammation as well as a challenge with detoxification (those things in our body that disrupt our organ systems from functioning at their highest level). My first response to my 43 year old male patients was that we needed to look for evidence of inflammation and try to determine where that inflammation was coming from. Simple blood tests can unmask high levels of inflammation that allow me to put my investigator hat on to determine root cause. For this patient, we discovered that he had a high c-reactive protein and insulin level. That indicated what I had suspected – inflammation in his body was contributing to his problem. Next, I needed to determine the cause of his inflammation. Common causes are food sensitivities, organisms like yeast (candida), and even heavy metals like mercury, lead, aluminum, and/or arsenic. It is amazing how much each of us may be exposed to metals – through ground water, air, silver fillings in our mouth, vaccines, and even our food. Most people are unaware, for example, that we can be exposed to high levels of arsenic through ground water, chicken, Brussel sprouts, and rice. We have to be our best advocate when it comes to food and drinking water so please source your food and water! After several visits and additional testing, I was able to determine that he had candida and elevated mercury levels. His potential exposures to mercury were determined to be from both vaccines over the years (thimerosal) and 6 silver fillings from his teenage years. Metals tend to settle in brain, bone, and fat and can be a hidden disruptor for many patients suffering a chronic disease that allopathic medicine simply manages instead of trying to reverse. We treated his candida by healing his leaky gut – using an herbal supplement that has anti-yeast properties along with a gut protocol to restore his small intestinal lining – allowing for increased absorption of vitamins and minerals crucial to elevating his body’s systems to function at their highest level. We also had him avoiding high inflammatory foods like gluten and cow’s milk, since we did not want to add fuel to the fire (i.e. inflammation). I had him take other supplements that would reduce inflammation (like fish oil and turmeric). For detoxification, I had him drinking more water, eating daily cruciferous vegetables, and using an infrared sauna weekly for 12 weeks. Once his gut was healed, we were able to use a chelating agent for several months to rid his body of the mercury it was storing. After working together for 6 months and reducing the candida and removing the mercury in his body, my 43 year old patient was doing great and feeling like his 20 year old self. His irritability was gone, he found happiness in his personal life, and even felt like he had a better attitude with his work. Other common nutritional deficiencies contributing to depressed mood include omega 3 fatty acids, vitamin D, and B vitamins. There are a few decent blood and/or urine tests to determine these levels but in common dosages they are very safe to experiment with for a few months to see if your mood improves. Abnormal thyroid function can also contribute to depressed or anxious moods. And obviously depression, anxiety or any physical symptom can be a shout out that you may have to come face to face with a certain stressful situation in your life – do not ignore this if you figure it out! When we put our thinking caps on and try to uncover root cause, you – the patient – can ultimately achieve a higher quality of life. 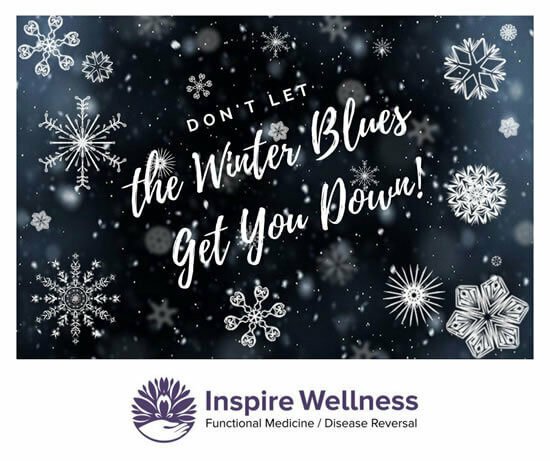 If you or anyone close to you lives with any chronic issue (including a mood disorder) and wants to work on identifying and reversing the underlying problems, come see us at Inspire Wellness.